7.1 The plateau has highlighted the presence of external settlements. In the case of the �Women Know� tumulus is suggested to be a post-Roman feature. However, it presents a cinerary cist, dating in the Bronze Age. The main structure is the prehistoric ritual structure individuated under the fort and perfectly E-W oriented. After the Romans had withdrawn from southern Scotland, another little tumulus was erected on the east counterscarp bank (Pitts & St. Joseph 1985: 247-252). A similar situation has referred in Hayton where the fort lays to few meters of the ancient IA encroachment (Johnson et al. 1978: 58-60, fig. 2) (Fig. 12). The tough schematism of a fort could be justified with the choice of the site. The Romans could have voluntary superimposed the classical scheme of a camp to a pre-existent situation, seeking the sacral or divine support. 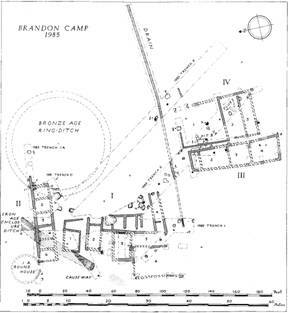 7.2 By the few naturally fortified sites of Britain, already occupied as that of Brandon Camp (Herefordshire), the Romans did not adopt the square shape design, but adapted itself to the previous native situation (Frere et al. 1987: 55-59, fig. 9) (Fig. 13). 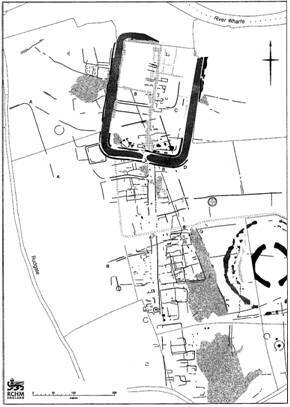 The same process seemed to be in act at Newton Kyme (North Yorkshire) where a vicus was enveloping long the main street and around the fort, demonstrating a strong attraction in regards of natives (Boutwood 1996: 342, fig. 7) (Fig. 14). A very small example of the transformation into a small town can be represented by Alchester (Fig. 15) and Auchendavy (Fig.16) (Sauer et al. 1999: fig. 6; Keppie & Walker 1985: fig. 1, photos A, B), where the modern structures are themselves superimposed to the ancient plan of the Roman camp and Cramond (Edinburgh) considered an attraction pole for the settlements around it (Fig.17) (Rae & Rae 1974; Masser 2006). Outside of Britain, external enclosures appear in the Caraş-Severin, where it seems to give the beginning to an urbanistic system outside the fort (Fig.18). At this point, we are going to ask whether the external structure, as the baths, were built to prevent dangerous situation due to the fire or to involve and influence the local people to the Roman behaviors (Tac. Agr. 21; Ellis 1995: 103). 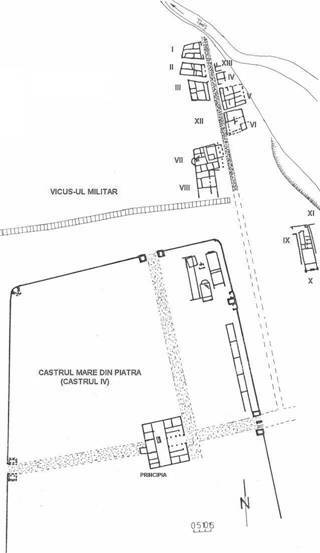 The proceeding work to build a Roman fort keeps in mind some main elements: The choice of a defendable location, the positioning, levelling the rough field, the sacred prescriptions (auguralia) and the rational or scientifically organisation (Veg. I, 22; iii 8.2-3; Caes. Civ., ii, 25.1; 31.2; 35.4; Gall. ii, 17.1; viii, 7.4). 8.1 The foundation of a new settlement consisted of an Etruscan ritual (Vitr., De arch. iv.1.9). The Augur was situated in the centre of a large circle facing eastwards, determining the centrelines. From here there began two streets which, crossing in the middle, formed the X (deces � ten) from which the decumanus (or Via Principalis) got the name, oriented in East-West direction (Sorel 1974: 36). This has been highlighted as the perfect centre of the city of ancient Marzabotto (Fig.19) where there has been discovered a �X� graffito carved on a stone surface. (Woodward & Woodward 2004: 83, Fig 4, C; Mansuelli 1967; Mansuelli 1974, 227-251; 289-297). This street crossed two raster fields with fixed designations showing as front field and rear field: the praetentura and raetentura of the military camp, reflecting the quadri-partite sky division on the earth and becoming a �religious microcosm� (Helgeland 1978: 1488-1495; M�ller 1961: 22 ff.). 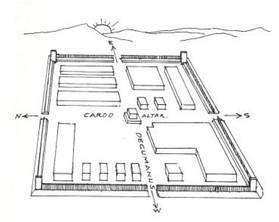 The fort was square shaped and surrounded by a ditch, enclosed by a sacred right-angled wall. The main public thoroughfares crossed the centre of each side through the doors. 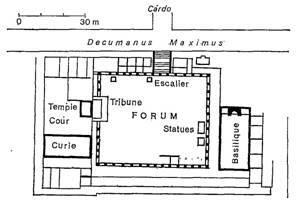 The forum, the centre for all social activities, was in the intersection of the two axial streets and there was located the altar of the camping (augural) and the commander building (Fig.20) (Snodgrass 1990: 57-60). There are reasonable argumentations for the orientation of a Roman camp as �archaeoastronomical phenomenon�, that seem demonstrate scientifically a solar orientation of most of Roman forts in Italy (Magli 2008: 67) (Fig.21). Fig.21 - Range of the rising positions of the sun in relationship with the axes of a castrum (after Magli 2008: 69, fig. 2). The case of Augst appears the most interesting. The decumanus maximus had been moved 54 degrees from North to East and corresponds to the rising sun in the summer solstice. It is the axis that established E-O direction observing the raising sun in the first day of centuriation (Front. xxvii, 13; 31, 1. Hyg. Grom. cxvi, 10) and it signed the foundation day of the camp, fort or colony, as a distinctive sign. Augst would have founded the 21th of June 44 BC (Laur-Belart 1973; Stohler 1957). A relevant number of Roman camps became the nucleus of towns or an extension of themselves. 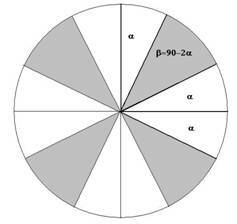 Some of these, as Ansedonia and Timgad (Fig.22) (Saumagne 1962a; Saumagne 1962b) are orientated by the cardinal points (Carl 2000: 334). 8.2 Attempts to establish the orientations of Roman camps and forts by mathematical investigations are contrasting. In one case, the researchers argues that the orientation is non-random and so relied on some form of astronomical observation (Richardson 2005: 514-426). In the other contrasting example, they argued that this relies on a flawed use of the Chi-squared test, not an useful method due to the relative low number of data sample (Peterson 2007:103-108). A third way has tested. 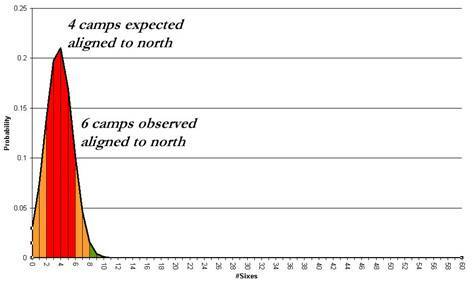 Examining the camps in England, using the so-called �binomial test� drawing two �speaking� conclusion-diagrams (Fig.23 - Fig.24). 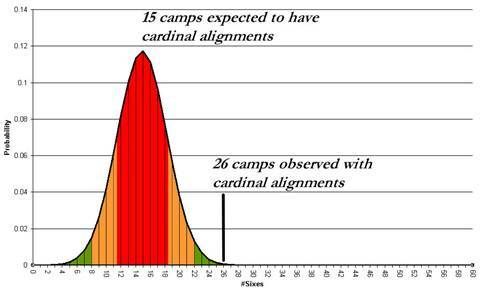 There is a clear tendency to the orientation to the cardinal points which is hardly justifiable with strategic reasons (Salt 2007; Magli 2008: 69). 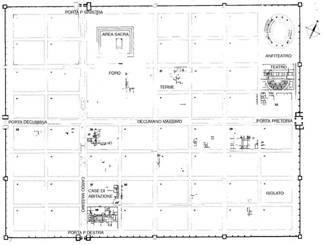 8.3 The centre of the entire enclosure were the principia or headquarter, planned to have a foreside reunion building with a temple connected at the rear side (Pitts & St. Joseph 1985: 79-80). Here was posed the shrine for the sacrifices, where along with the headquarters this became one singular enclosure delimited by a quadrangular �fence� (Pasquinucci: 273-274; Grant: 299-300; Milan: 239-249; Webster: 167-230). 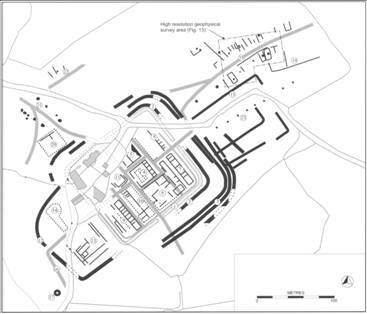 At Inchtuthil, this �core� was the smallest known at any legionary fortress, even if the shape seemed to be always the same as at Longthorpe, Pen Llystyn, Gelligaer and Fendoch, Chester and Caernarfon (Bowman 1974: 19; Nash-Wiliams 1969: 157-8; Richmond 1939: 126; Pitts & St. Joseph 1985: 95-96, 100) (Fig.25). Recent researches from Wales have brought a new light on the internal organisation of the principia. They have in at least three cases an almost identical plan and similar dimensions at Cefn Caer (Fig.26), Bryn y Gefeiliau (Fig.27) and the identical Llanfor (Fig.28) (Hopewell 2005: respectively, 229-231 fig. 3; 240-1, fig. 7; 249-250, fig. 11). The only fortress to have had a similar extension of principia was Exeter (Bidwell 1980: 8-9). 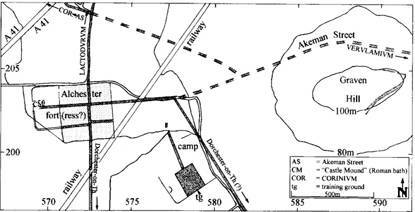 At the same time, the orientation of the main part of the camp, which should convert the market as in a hypothetical colony as at Timgad (Fig.29) (Sorel 1974: 36). In the centre of the principia there has been found a pit on the same axis of the enclosure. 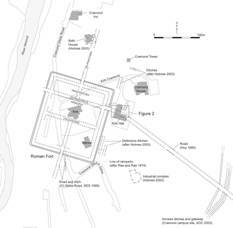 It has got argued that many pits and well deposits known from Romano-British towns and military sites also reflect everyday ritual behaviours at Newstead (Clarke 1997; Clarke 1999: 42) and at Silchester which reflect the continuation of prehistoric traditions of such ritualistic and depositional behaviour into the historic Roman period. It is possible that the same situation has happened at Inchtuthil (Fulford 2001; Woodward & Woodward 2004: 77; Pitts & St. Joseph 1985: 247-252). That was the sacred function, the same of the Capitol in Rome. This identification could be confirmed by the high podium of the temple assumed to be behind the basilica, for the position of the enclosure at the cross of main streets and for the presence of an altar or �sacrificial pit� in the centre of the court of the basilica as well as attested at Nijmegen (Bogaers et al. 1979: 41-2). 9.1 The main aim of building a camp should be that to build a �familiar habitus (context)� where the soldier would feel at home (Veg. ii, 25.8), so that ��so winter in them held no fears� (Tac., Agr. : 22,2). At Inchtuthil, that corresponded to a necessity of safety, guarantied through eight probable granaries, positioned near the gates and explicated with an easier logistic easy supply-function and ease of distribution to the common soldier (Manning 1975: 108; Pitts & St. Joseph 1985: 117-8; Richardson 2004: 438). This disposition seems to have the same concept of those discovered in Valkenburg, while in Britain one similar has not yet found. For dimensions, they are comparable only to Exeter. In Chester and Usk they were grouped together, while the disposition at Bad Nauheim-R�dgen or South Shields refers to Inchtuthil (Richardson 2004: 438). The hospital responded to the safety-necessity of the fighters and represents the most impressive structure of Inchtuthil for position, precision of building and for wideness (Hygin. 4). However, the hospital is smaller than that of Xanten and larger of those at Neuss and Windish, while one similar seems to be of Caerleon (Boon 1972: 76; Pitts & St. Joseph 1985: 91-96, 100; Petrikovits 1975: fig. 27). 9.2 With all these features, the camp was considered as embryonic colonies and models for new city forms (Haverfield 1911; 1913; Laurence 2000: 346-348) with the intention to create an image of Rome (Owens 1991; Laurence 1994a). In hostile areas and in period of aggression, the transformation of a Roman camp into a colony or a city was a normal process of the Roman system. 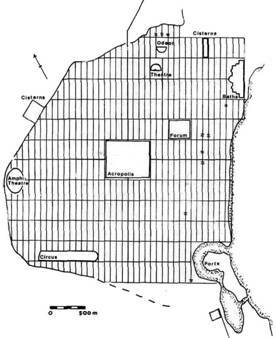 The first fort must be considered the first colony of Rome, Ostia in the middle 4th century BC (Laurence 1999). 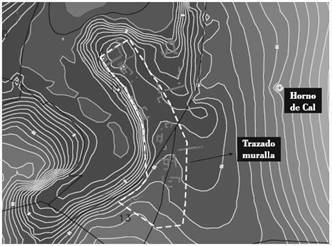 In a few cases, the strategic location seems to be preferred to the sacred as Ansedonia founded on a hilltop and Sanitja, where there was built an irregular camp, not �classically� disposed (Contreras 2006) (Fig.30). 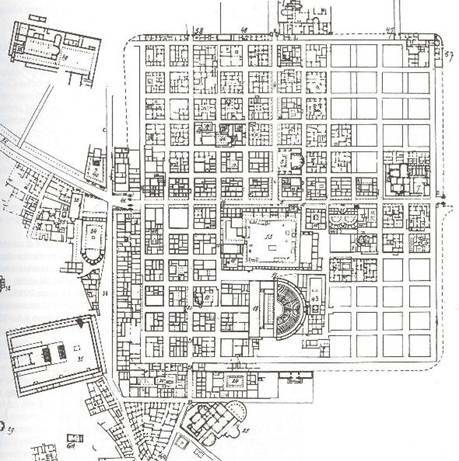 Carthage, after the destruction in 146 BC, was built again by the grid system as a huge military camp (Fig.31) (Ellis 1995: 93-4, fig. 7.1). 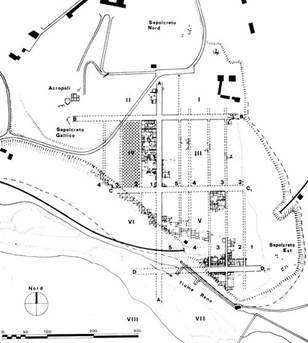 The Roman fort-town became an emanation of the Empire under the Julio-Claudian dynasty as at Aosta (Fig.32) and Torino, both bringing the name of the first Emperor (Magli 2008: 63, fig. 1). The character that set up the colony of Osuna in the 40s BC, provided detail of the place of cosmology within the structure of the city (Crawford 1996, 393�454) and in the north-African colonies of Lamb�se, Tebessa, Djemila and Timgad (Fig.33), which represent the logical evolution from Trajan foundation to an amazing metropolis (Courtois 1951; Sorel 1974: 36). The early medieval Barcelona (Fig.34) represents the �still living� example of this process (Banks 1984; Pallares 1972; Sanpere 1980). 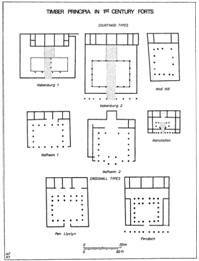 Probably that is not a case, whether in the maximal expansion of the Roman Empire, happens an osmotic feedback, when the layout of the Trajan Forum conceived as a replica of enormous headquarter (Magli 2008: 70) (Fig.35). The temples and the Capitol were prominent, overlooking the city, and the walls provided defence following, after the legend, the ideal of Roma Quadrata (Squared Rome) arisen on the Palatine. This idea appears evident at Terracina, overlooked by the monumental sanctuary of Jupiter Anxur. Ritual or ceremonial content appear to involve the paradigmatic aspects of the home city co-ordinating this with the political and religious authority. The Roman camp overtakes the astral conception in a functional conception, changing the meaning and the using from a pure religious conception into a real essence of architecture. However, the religious feature represents the awareness of the Roman city, which is not very different from the sacral landscape of Britain. The difference consists in the envelopment due to a perceived necessity for a defensive frontier strategy in response to continued invasion. The fort enveloping in a city, in Roman culture, became a metaphysical items in which the cives finds refuge and protection. It constituted a physical image, a representation of ideas, the immanence and �collective imaginary� of citizens of Empire, �understanding of the universe, centred ultimately on the city of Rome itself� (Laurence 2000: 346-348). Abercromby, J., Ross, T. & Anderson, J. 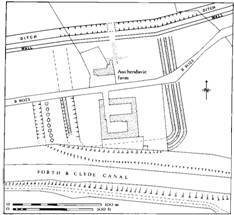 (1902) �Account of the excavation of the Roman station at Inchtuthil, Perthshire, undertaken by the Society of Antiquaries of Scotland in 1901�, Proceedings of the Society of Antiquaries of Scotland 36 (1901-02), 182-242. Baatz, D. (1964) �Zur Frage augusteischer canabae legionis�, Germania 42, 260- 265. Banks, Ph. (1984) �The Roman inheritance and topographical transitions in early medieval Barcelona�, Papers in Iberian archaeology, BAR International Series, num. 193, Oxford. Cagnat, M.R. (1913), L�arm�e romaine d�Afrique sous les empereurs, Paris reprint in Paris, 1975. Clarke, S. (1997) �Abandonment, rubbish disposal and 'special' deposits�. In: TRAC 96: Proceedings of the Sixth Annual Theoretical Roman Archaeology Conference Sheffield 1996 (eds K. Meadows, C. Lemke and J. Heron). Oxford: Oxbow, pp. 73-81. Clarke, S. (1999) �In search of a different Roman period: the finds assemblage at the Newstead military complex�. In: TRAC 99: Proceedings of the Ninth Annual Theoretical Roman Archaeology Conference Durham 1999 (eds G. Fincham, G. Harrison, R. Holland and L. Revell). Oxford: Oxbow, pp. 22-9. Collingwood Bruce, J. (1895), Handbook to the Roman Wall. Ed. 13 by C.M. 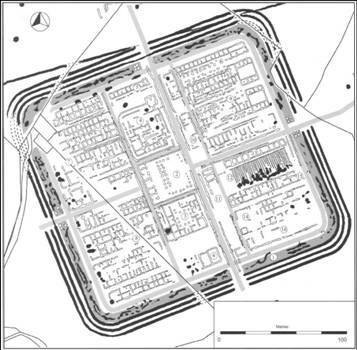 Daniels, 1978, Newcastle-on-Tyne: Andrew Reid & Co.
Contreras, F. (2006) �The Roman Military Fort at the Port of Sanitja�, in: Historia de las Islas Baleares, El Mundo, vol. N� 16,. Fulford, M. (2001), �Links with the past: pervasive 'ritual' behaviour in Roman Britain�. Britannia, 32: 199-218. 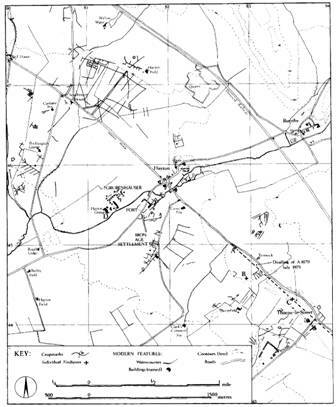 Manning, W. H. and Scott, I. R. (1979) �Roman Timber Military Gateways in Britain and the German Frontiers�, Britannia 10, 19-61. M�ller W. (1961), Die heilige Stadt. Roma Quadrata, himmlisches Jerusalem und die Mythe vom Weltnabel. Stuttgart: Kohlhammer. Richardson, A. 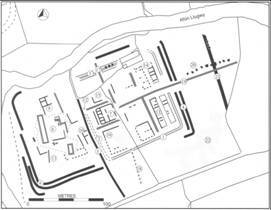 (2005) �The Orientation of Roman Camps and Forts�, Oxford Journal of Archaeology 24(4). 415-426. William Smith, D.C.L. (1875), A Dictionary of Greek and Roman Antiquities. London: John Murray.